Using the online file conversion service of Online-Convert.com is completely free for files under 100 MB. However, we have already pointed out the advantages of registering for a free account. Following up on this, we would like to have a closer look at one of these advantages: the Online-Convert.com user dashboard. Read more to find out about all the information you can get from the dashboard and how you can effectively use it. 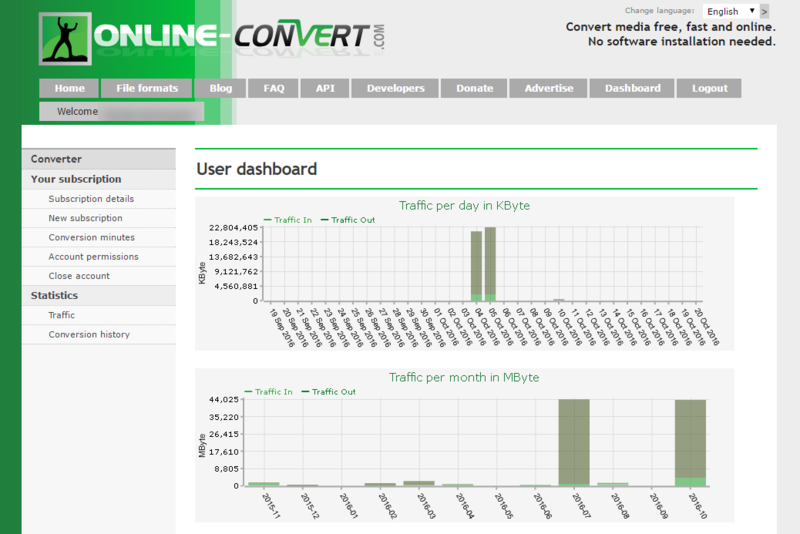 On your Online-Convert.com user dashboard, you can access different pages using the side navigation. 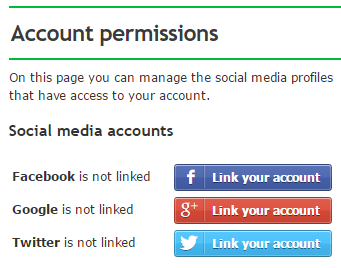 There, y a user can find different information about their account, conversions made as well as some other features. We will talk about them all in more detail below. On this page, you’ll find a general overview of your account. Any active premium plans you bought will be displayed here together with crucial information about the plan like the maximal upload file size. Furthermore, this is where you find your API key. You need this one to use the Online-Convert.com API. Related to this, you can find an overview of the amount of conversion minutes you bought and still have available for your key there. Want to know more about our API? Check out this tutorial on how to test our API with postman. Navigating to “New Subscription” will enable you to buy a premium plan that allows you to convert files bigger than the 100 MB of our free plan, experience our service add-free and more. Find out more about our premium plans. The usage of the Online-Convert.com API is free with certain limitations. Just like with the web service, users are limited to uploading files with a maximal file size of 100 MB. Furthermore, the amount of conversion minutes for a free use of the API is limited to 30 conversion minutes within 24 hours. In order to fully use the API, you can buy more conversion minutes from your dashboard. Here, you can facilitate your login. How? By linking a social media profile to your Online-Convert.com account. Find out more about social media login on Online-Convert.com. If you want to close your Online-Convert.com account, you can do so on this page. To do so, you have to check the box and confirm that you want to close your account by pressing the “Close account” button. Note that, in case you have a subscription to a silver, gold or platinum plan, you have to also cancel this subscription on PayPal. 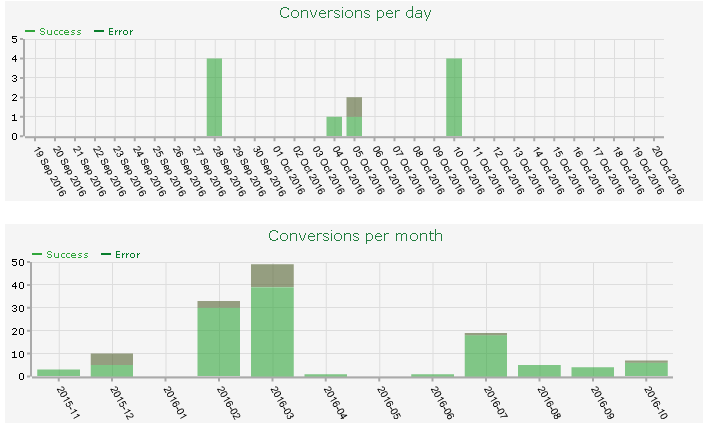 These two charts give an overview of conversions done per day and per month. The daily conversion overview shows the amount conversions conducted in the past 31 days, while the monthly overview provides an overview of the past 12 months. Both charts list the successful conversions (light green) and conversions that caused an error (darker green). 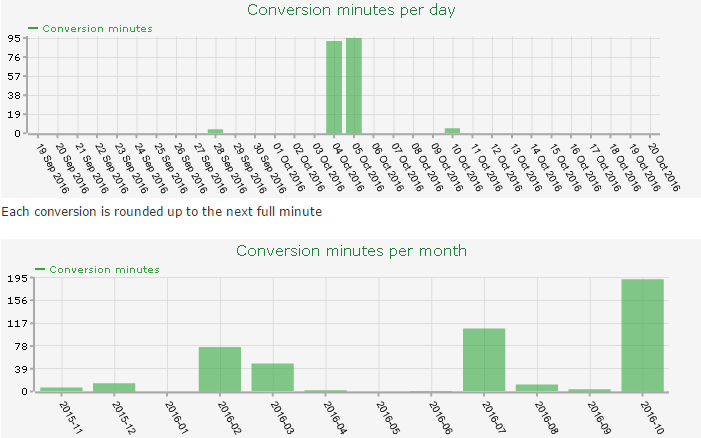 The consumption of conversion minutes by day (dating back 31 days) and per month (dating back 12 months) are displayed in these charts. The conversion history provides you with a list of conversions done in the past 24 hours. Using these links, you can re-download the converted files, use them for further conversion, or permanently delete them from our servers if you don’t want to wait until they are automatically deleted after 24 hours. Furthermore, you can access the conversions that did not work and provide our support team with the error number given on the page. If you have any questions about your account or the user dashboard, don’t hesitate to send us a message. Our friendly support team will take care of your request.